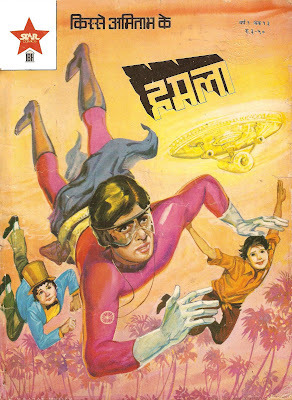 Mard is a 1985 Hindi film, starring Amitabh Bachchan and Amrita Singh and directed by Manmohan Desai. It was Bumper Hit and was biggest hit of 1985. Its collection record was broken after 4 years in 1989 by Maine Pyaar Kiya. The film was remade in Tamil by Rajnikant as “Maaveeran”and was a huge success and further dubbed in Telugu which itself was superhit. This is only movie in indian cinema which got bumper success in four different versions. The film opens in India. It is the early 20th century, when India remains part of the British empire. The opening sequence shows a group of British soldiers plundering an Indian fort and taking its riches by air to England. They are stopped by the valiant Raja Azad Singh (Dara Singh). Raja Azad Singh is of immense strength, and manages to lasso the light aircraft, subdue several English soldiers and recover the stolen jewels. Around this time, Raja Azad Singh’s wife Rani Durga (Nirupa Roy) gives birth to a baby boy. The Raja carves the word mard (man, intending to convey strength and bravery) into the newborn’s chest, noting proudly that the baby is smiling throughout, and can apparently feel no pain. (His words, mard ko dard nahin hota, meaning a true man feels no pain, is a tag line throughout the movie.) The British commission conducts an investigation, led by a sympathetic and liberal Englishwoman, Lady Helena; the investigation uncovers the atrocities of the English troops and results in several officers being officially reprimanded. Lady Helena is a close confidant of Raja Azad Singh, and is generally supportive of the Raja and of India becoming independent. The English officers General Dyer (Kamal Kapoor) and Inspector Simon (Bob Christo) conspire with a sniveling, weak willed local doctor Harry (Prem Chopra) to capture the Raja. Harry sedates the Raja; weakened thus, the Raja is captured and imprisoned in a dungeon. Rani Durga escapes on the Raja’s faithful steed Bahadur. But she is shot, and the horse brings the baby mard to a local orphanage for safekeeping until Rani Durga can recuperate and reclaim him. The wife of a poor blacksmith spots the baby in the orphanage, asks after him and eventually adopts him. When Rani Durga returns, she is shocked to find him gone and she loses the ability to speak. The penniless Rani Durga eventually becomes a washer woman. The traitor Harry is appointed mayor of the town for his part in the capture of the Raja. Raju grows up to become a strong youth under the care of the loving blacksmith and his wife. His day job is to run a tanga. One day, he happens across an arrogant and oppressive young woman who blithely runs her car over an old lady. Raju gives chase, intercepts the young woman, and compels her to apologize to the old lady. The young woman is of high birth, and her bodyguard Zybisko (Manek Irani) engages Raju, but Raju fends him off quite easily. The young woman turns out to be Ruby, the debutante daughter of mayor Harry and the old woman is Rani Durga. Ruby apologizes. But she is charmed by Raju’s rugged looks and candor. He initially refuses her advances in order to maintain his independence. But she eventually falls in love, changes his heart, and invites him to her birthday party. Harry and General Dyer continue their relentless quest for power. Their first move is to demolish the basti (slum colony) in front of Harry’s mansion. Raju rallies the basti dwellers to oppose the demolition crew and picket Harry’s mansion. Harry arrests Raju and is about to execute him when Lady Helena and Anurag arrive at the scene promptly. Lady Helena and Anurag stop the demolition, reprimand Harry, and release Raju. Harry tries to buy off Raju, but upon Anurag’s advice and support Raju douses the cases with liquor, sets it afire, and uses the soot to blacken Harry’s face. (No, it is certainly black money, for it burns black, he observes!) A frustrated Harry tries to have him shot, but Ruby intervenes upon Anurag’s insistence, professes her love for the tanga wallah (tanga driver), and threatens to completely disavow her father if any harm should befall him. Unable to subdue or subvert Raju, a frustrated set of cronies (Harry, Dyer, Simon and others) fret and fume, wanting to kill Anurag who, with Raju’s help escapes and soon flees to England, living with a family who provide him with shelter and love in the heart of Harrow. The film introduces Danny (Dan Dhanoa) the son of General Dyer. Danny is every bit as corrupt, cunning and avaricious as his father and his cronies. Danny runs the nefarious operations beneath the outwardly clean, lordly and manorial life of General Dyer and mayor Harry. There are three such operations. First, there is a secret blood camp; basti dwellers that are infirm, aged or otherwise unfit are secretly abducted and their blood (all of it) is involuntarily extracted to supply British war campaigns elsewhere. Second, there is a slave labor camp where, again, basti dwellers are put to work (with no pay) on various civil and construction projects for the British empire. And finally there is Raja Azad Singh, still imprisoned, and a champion for the basti and for the workers in the labor camps. His primary duty is to turn, by hand, a massive flour mill; this mill is the only source of food for the camps. (Rani Durga, it turns out, is a washerwoman in one of these camps.) The camps grow in size, and Raja Azad Singh secretly plans to have them revolt; this becomes a growing concern for Harry. Harry and General Dyer decide the best way to remove Raju from the picture is to announce the engagement of Ruby and Danny. Ruby strongly opposes this and runs off with Raju. Danny gives chase with his men, and even tries to kill Ruby, but eventually brings her back to Harry. Harry is truly enraged. He threatens to kill Ruby if she ever disobeys him again. Danny devises a nefarious plot to get rid of Raju. Danny learns of Raju’s lineage. Realizing Raju will attack the camp to free the blacksmith and Raja Azad Singh, Danny plays the second step of his plot and lays a trap. Raju enters the dungeon to rescue his father. But it turns out that Raja Azad Singh has been replaced by a masked impostor (Simon), and Raju is captured. At this point, Danny devises a fatal final step. He announces a gladiatorial sword fight between Raju and Raja Azad Singh where the winner will go free. Prior to this fight, he takes steps to ensure father and son are truly bloodthirsty for the other. Raja Azad Singh is brought to a blood camp where he sees Raju (actually a masked impostor) extracting blood from innocent citizens and swearing loyalty to the British; the Raja is incensed and swears to finish him off in the contest. Concurrently, Danny sends word (through Ruby) that the fighter opposing Raju will be a masked impostor and not the real Raja. Raju, in turn, announces he will not let his opponent leave the ring alive. And Danny forthwith arranges to have the real Raja fight Raju. The contest begins on the next day, and father and son are soon in a crazed sword fight. The duel takes a turn when the Raja spots the word mard on Raju’s chest, and Raju notices one of his blows drew blood from the Raja’s cheek. They quickly discover the truth, and keep up the appearance of a death duel until the Raja hoists Raju off the arena and into the viewing gallery. Raju plunges his sword into General Dyer, killing him instantly. Danny is infuriated. He orders his tanks to finish off Raju and the Raja. (Lady Helena and Rani Durga are strapped to the tanks, with British soldiers holding them at gunpoint.) Raju and the Raja seize horses and escape, with the tanks in hot pursuit. After a long chase and fight, Raju and the Raja overpower the tanks, rescue the ladies and engage the villains in combat. After a hard sword-and-gun fight, Harry, Danny and Goga are drowned in quicksand, and Raju and his father return victorious. The film ends with Raju and Ruby coming together and being reunited with Raju’s real parents, on the dawn of India’s independence movement. ~ by Yakuza on November 7, 2009. From today’s standard this might be crap for many, But this is my personal favorite entertainer, I was just 7 years old when i saw it on VCR at home, i found it extremely entertaining at that time, later in 1996 i saw it in theater, it was pleasure to watch it again, i realized same passion for this on repeat viewing, since then i made at least 4-5 visits to this and never get bored. No offense, but this is my personal childhood favorite. Yeah SRK’s stupid candyfloss flicks like Kuch Kuch Hota hai and Rab Ne Bana Di Jodi are world classics according to you. This film was very entertaining and is thousand times better than any candyfloss flick of Shahrukh Khan or slapstick comedy of Akshay Kumar. No Way Q, even i know in advance, Mard has not many takers. Glad you put in your thoughts… :)!! Yakuza can u plz do Maine Pyar Kiya da way u done Mard plz. its after thinking and going back to such films do we appreciate Amitabh Bachan and realize wat a fantastic actor he was and still is. btw great work once again. thanks sir.what a great movie.thanks again sir to bring one of my favourite movie. Glad, you like it !! simply superb film.very disscusting about that peoples who r saying to this film is bad film.i think they don’t know about films,r may be they r anti-amitabh.thanks for bringing blockbuster film MARD.thanks Yakuza.we hope u will bring film COOLIE also. It a sweet detail,i enjoyed it.pls,narrate maine pyaar kiya the same way.thanks. WHAT WAS THE DP OF MARD?AND HOW MUCH WAS THE DISTRIBUTOR SHARE?PLEASE TELL YAKUZA BHAI?